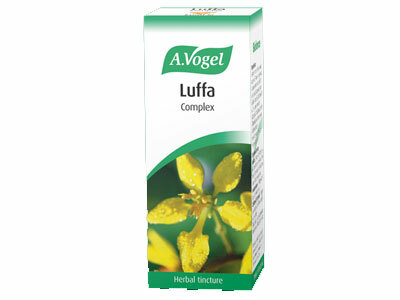 Order A. Vogel (Bioforce) Luffa Complex 50ml from the Online Health Food Store UK. Buy A. Vogel Luffa Complex drops (50ml tincture) and other quality Other Herbal Remedies safely online in the UK. Luffa Complex drops is a botanical food supplement made from a complex of herbal extracts. If you want to automatically receive an email when 'Luffa Complex 50ml' is back in stock, just leave your email address below. A. Vogel's Luffa Complex is produced using extracts of seven freshly harvested, organically grown tropical herbs. All the herbs are picked fresh and used within 24 hours of harvest. Our UK Health Shop sells real A. Vogel (Bioforce) and other Other Herbal Remedies from top-quality brands safely online to customers throughout the United Kingdom in England, Wales, Scotland and Northern-Ireland. Where to buy A. Vogel (Bioforce) Luffa Complex 50ml safely online? Shop at the Online Health Food Store if you are wondering where you can buy A. Vogel Luffa Complex drops (50ml tincture) safely online in the United Kingdom. Luffa Complex 50ml - A. Vogel Luffa Complex drops (50ml tincture) in Other Herbal Remedies and Herbal Remedies, Tinctures & Supplements.